Just last week it was announced that Ontario-born artist Rebecca Belmore is the winner of the 2016 Gershon Iskowitz Prize at the AGO. The award, presented annually to an artist who has made an outstanding contribution to the visual arts in Canada, includes a $50,000 cash prize and a solo exhibition at the AGO within two years. She becomes the 30th artist to receive the prize, and joins a list of celebrated figures including Michael Snow, Liz Magor, Betty Goodwin, General Idea, Stan Douglas, John Massey, Geoffrey Farmer and last year’s winner, Sandra Meigs. Pretty good company! We recently sat down with Julia Galvez, the Jackman Hall Coordinator and a member of the AGO’s Visitor Experience team, to get the scoop on what she does and why she loves it. She’s been in her position for almost three years, and worked at shopAGO and in Member Services previously. How did she find her current role? “It chose me,” she says. Filmmaker Guillermo del Toro loves monsters, or “the patron saints of otherness,” as he calls them. And since debuting last August at the Los Angeles County Museum of Art (LACMA), the exhibition Guillermo del Toro: At Home with Monsters–which arrives at the AGO next fall–has been inspiring visitors to create their own. Every weekend a pop-up installation and drop-in drawing activity takes over an area of the museum, inviting visitors to respond to themes in the exhibition, then sending them out into the world of social media using the hashtag #gdtinspired. Have you voted for the 2016 AIMIA | AGO Photography Prize yet? Today, nearly everyone can make their own photographs with a quick tap on a touchscreen. But what images truly move us? And who can make us question our ideas and assumptions about photography? The 2016 AIMIA | AGO Photography Prize exhibition, running until January 1, features four finalists who push the boundaries of photography as an art form. The winner of the prize receives $50,000, making it Canada’s largest award for contemporary photography. The most exciting part is that you, the viewer, get to directly participate by casting your vote for the artist whose work speaks to you personally. Voting closes on November 27 at 11:59 pm EST, so now’s the time! One of the many highlights of the AGO’s newest exhibition, Small Wonders: Gothic Boxwood Miniatures is the magnificent Chatsworth Rosary (c.1509–1526). Originally owned by King Henry VIII (yes, the one with many wives) the rosary has never before travelled to North America. Henry’s initials, as well those of his first wife, Catherine of Aragon, are carved on either side of the large bead’s hinge. We think that the bead was given to the couple as a wedding gift in 1509, before Henry banned rosary use in England in 1534 – one of many anti-Catholic changes instituted as part of the Reformation. Two national treasures collided back in 2014, when comedian Rick Mercer spent the day at the AGO. A highlight of that visit was a trip to our renowned conservation department where he met painting conservator (and all-around good sport) Maria Sullivan. Sullivan had been at work on Tom Thomson’s The West Wind, carefully removing old varnish in order to recover its saturated colours. Painted by Thomson over the winter of 1916-17 in Toronto, the canvas is one the AGO’s best-known and most prized works, and one of Thomson’s last works. You can see Rick’s handiwork for yourself. Tom Thomson’s The West Wind is currently on view as part of Mystical Landscapes: Masterpieces from Monet, Van Gogh and More. Travel to France…no passport required! The countdown is on: this acclaimed exhibition arrives at the AGO next spring. 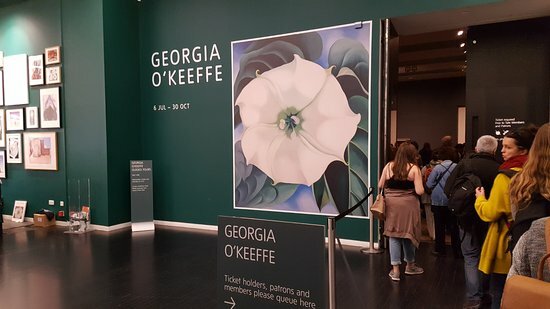 When Georgia O’Keeffe opened at the Tate Modern in London last July, it was the first major retrospective of her work seen in the UK in over a generation. The announcement of its arrival ran in newspapers across Britain and the US. With no works by O’Keeffe held in UK public collections, the Tate Modern turned to public and private collections across North America. And they succeeded: the exhibition brought together over 100 paintings spanning six decades of the artist’s career. Attracting huge crowds, the exhibition closed at the end of October and now makes it way to Vienna’s Bank Austria Kunstforum, where it will spend the winter before making its final and only North American stop in Toronto at the AGO. Last weekend the AGO launched Small Wonders: Gothic Boxwood Miniatures, a fascinating exhibition of exceedingly rare and tiny Gothic carvings. We also launched something that will exist long after the exhibition closes: an innovative new website called the Boxwood Project that allows visitors to get a (much) closer look at these miniature masterpieces. This interactive tool features high resolution photographs and scientific images of all known boxwood objects in existence. Why did we do this? We know there are people who want to learn more! By bringing these intricate objects together for the first time, scholars and enthusiasts alike will have the ability to create catalogues, compare objects, deep zoom high-res images and discuss their findings with the community. How did we do this? In their hunt to photograph these rare carvings, AGO photographers Ian Lefebvre and Craig Boyko travelled to public and private collections worldwide, including the Louvre, the Victoria and Albert Museum and the Rijksmuseum in the Netherlands. Holiday season is nearly upon us, which means a busy calendar of events, twinkle lights and celebratory drinks. It’s also time to figure out what to get for both the inscrutable teenager and has-it-all retiree in your life—and everyone in between. Never fear: shopAGO’s Members Shopping Week, running from November 15-20, makes it easy with extended hours, special jewellery trunk shows and chocolate tastings daily. AGO Members receive a 20% discount on all regularly priced items*. A Holiday Gift Guide makes it easy to select gifts for everyone on your list.